Direct Relief shipments of critical medicines reached several communities in Puerto Rico Sunday, places where access has been a challenge. Helicopters provided an infusion of help to the community of Utuado, as well as to the island of Vieques. The shipments sent out Sunday amounted to more than $120,000 in donated medicines and supplies. 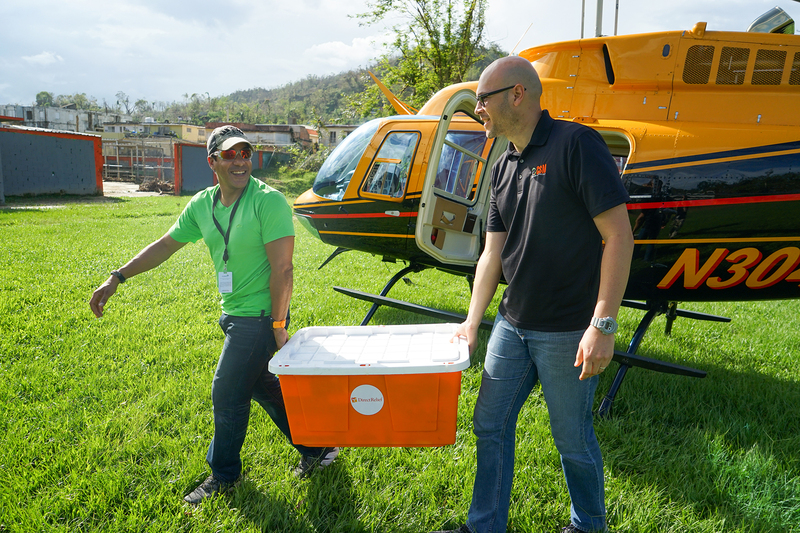 Samaritan’s Purse provided helicopter transportation to the mountain community of Utuado, which has had limited road access since daily rains have washed out much of the roadways and bridges that link the municipality to the rest of the island. The helicopter was able to move a shipment of Direct Relief medicine into the community in less than 45 minutes, a drive that would have taken all day from San Juan, even if the roads had been operable. On Sunday morning, the helicopter touched down in a muddy softball field down the street from Corporacion de Servicios Medicos, where the medicines were bound. Utuado resident Tito Camarillo heard the helicopter land and brought his three grandchildren to see the chopper. Camarillo said that the rivers that surround and flow through the town caused immense damage during and after Hurricane Maria made landfall, and the rains since have been massive, adding that in one day, the town saw 30 inches of rain. The medicines were delivered to the Corporacion de Servicios Medicos, which operates a health center in Utuado. Alexis Serrano, who works for the clinic, picked up the medicines Sunday and said that flooding in the town remains an issue. The clinic is in the midst of rebuilding much of their health system, and staff have been leaving the clinic instead of relying on patients to come to them. They’ve been conducting care in shelters, as well as going door-to-door to check on patients that are unable to leave their homes. “There are a lot of places in need here,” Serrano said. On Sunday, Direct Relief also secured transportation with the U.S. Coast Guard for shipments of essential medicine to a clinic in Vieques, operated by the medical system, Health ProMed. The island has also had access challenges, and the medical shipments will take the pressure off the clinic’s pharmacies.